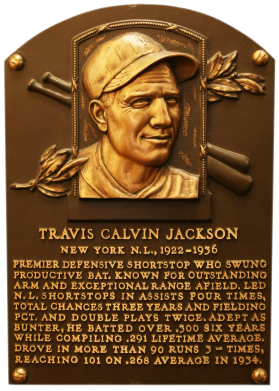 A solid defensive shortstop for the Giants of the 1920s and 1930s, Travis Jackson helped the Giants to four pennants. "Stonewall" also batted over .300 in six seasons, and he had more than 90 RBI in three seasons. He accumulated a career average of .291, peaking at .339 in 1930. 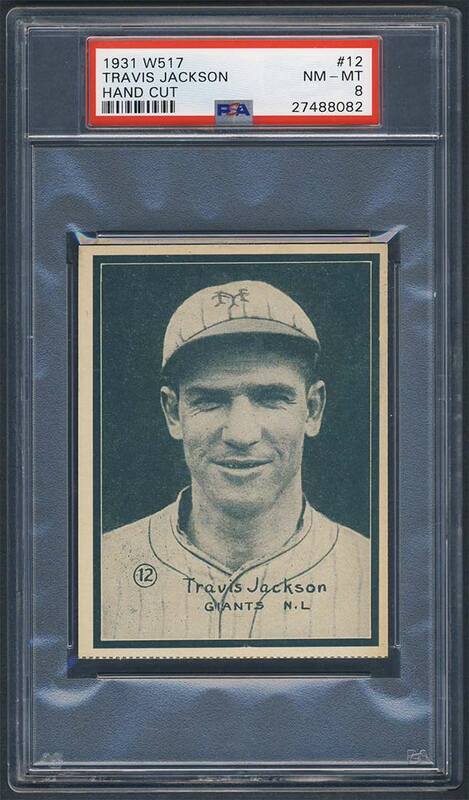 Comments: After looking through a few Travis Jackson cards, I selected 1935 Diamond Stars as my favorite portrait in December 2002 and I picked up a raw example of the card. I liked the shot of Travis looking over the dugout rail. I submitted the card to PSA and it graded VG. I eventually upgraded the card to a PSA 6 an then a PSA 8 in September, 2004. In August, 2007 I replaced the Diamond Stars with a W517 strip card in a SGC 40 holder. I liked the portrait more and preferred Chick Hafey represent the Diamond Stars set. Not a month later a SGC 70 W517 example was offered through Net54 from seller Scott Hanson and I bought it. I had one opportunity to upgrade to a SGC 80 in 2011 but the price just wasn't right to justify a ½ grade bump. I'd really like to bump this to a NM+ card someday - still looking for one out there somewhere…. 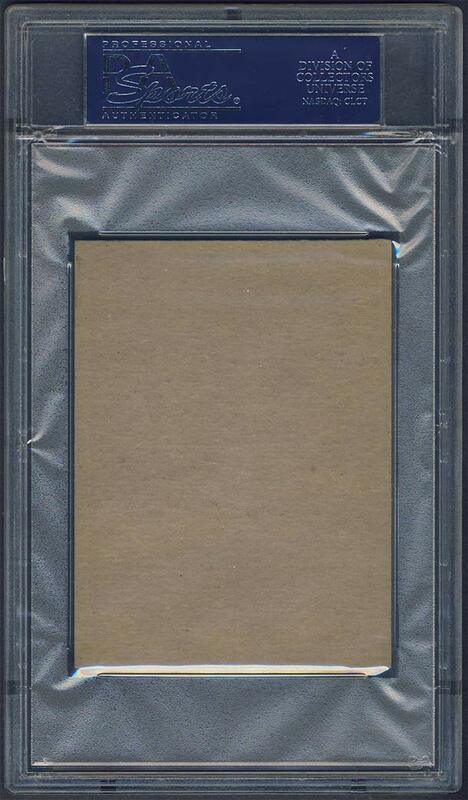 UPDATE: As I was browsing eBay before bed the evening of 9/29/2013 I found this SGC 80. The Buy It Now was at $89, I submitted a best offer at $65. The next day the bid was accepted and I got my 1/2 grade bump at 1/2 of what I paid for the SGC 70. Patience pays off sometimes. UPDATE: On March 4, 2014 during my lunch hour I was running some of my saved eBay searches and coming up short. Sometimes I just randomly start entering search criteria with the small hopes of getting a hit. This time around I typed - W517 Jackson - and clicked enter. The search results came up on the screen, and I scrolled down a page. POP! A PSA 7 was on the screen with a BIN of $300. I had paid $65 for my SGC 80 and couldn't justify spending that much on a small bump. But, I recognized the seller's ID and looked them up in my database to find an email. Within minutes I shot off an offer of $175, and they responded with $250. In the meantime I looked up the population reports and it was the lone highest graded PSA example; SGC had graded two 84 cards and one 88 example. After a couple more back-n-forth emails we settled at $225. It was a fun deal with great negotiation. 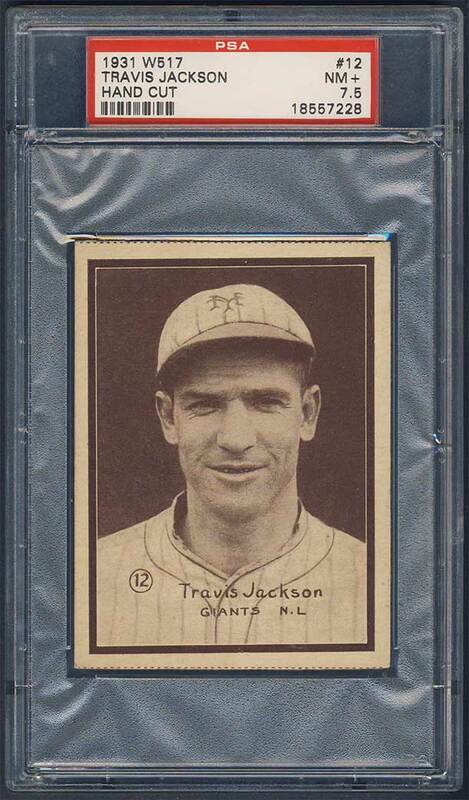 Can't wait to get the card…my first vintage upgrade to the HOF set in 2014. 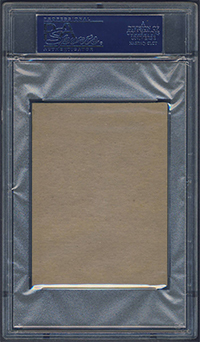 UPDATE: The PSA 7 was the highest grades example until news of Al Crisafulli's Winter Love of the Game auction (Jan/2016) broke. 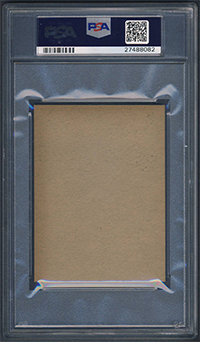 I browsed the online offering and came across a PSA 7.5 (Brown Tint). I had to have it and stayed up until 2:45am MST on the auction closing night to make sure of it. 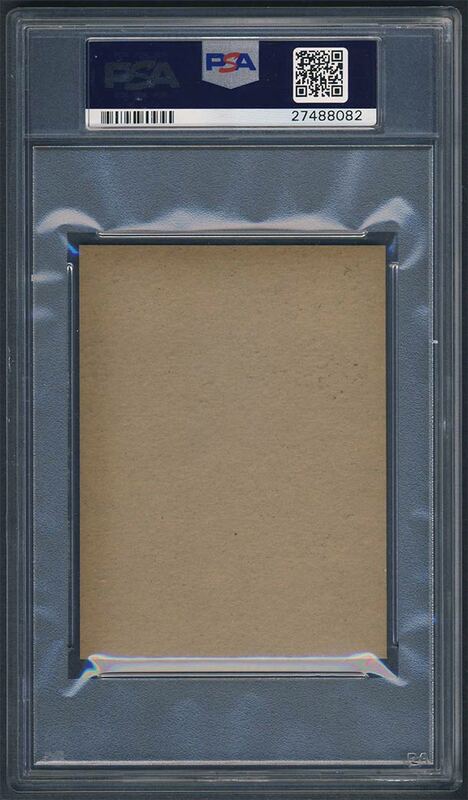 My bid of $110 + juice won the card so the highest graded example is still in my possession. 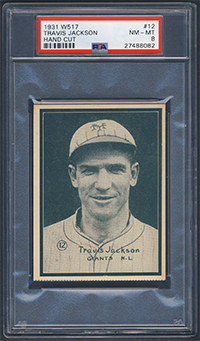 UPDATE: I arrived at 2017 The National Sports Collector's Convention as the show opened on Wednesday morning and immediately came across another upgrade - a PSA 8 (Green Tint), a card recently graded and the best Jackson example for the issue in the hobby. The price was a little high so I made an offer - SOLD!!! Up until this, I had not purchased a single baseball card for my HOF collection all year. I was not expecting to find much at the show I could use (within my budget) so it was a huge surprise and a great start to the weekend. 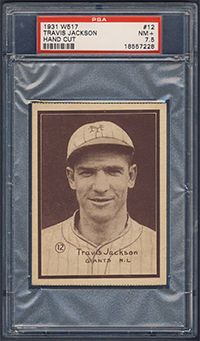 Description: The 54-player W517 set is a scarce issue of 3" X 4" cards which are generally found in a sepia color. There are, however, other known colors of W517s, which bring higher prices from specialists. The cards feature a a player photo as well as his name and team. The card number appears in a small circle on the front, while the backs are blank. The set is heavy in stars of the period including two Babe Ruths (#4 and 20). The cards were sold in vertical strips of three cards; some cards are found with baseball plays in a line at top.